Bring a pan of water to the boil, add the potatoes and cook for 12-15 minutes until tender. Drain and set aside. Bring another pan of water to the boil, carefully add the eggs and simmer for 6 minutes. Drain and rinse under cold water until cool. Crack the shells and carefully peel then set aside. Pat dry the tuna steaks then mix together half the French's Classic Yellow Mustard with the lemon zest and juice and brush over the tuna. Heat 25ml of the olive oil in a heavy based pan and cook the steaks for 1 minute each side or to your liking. 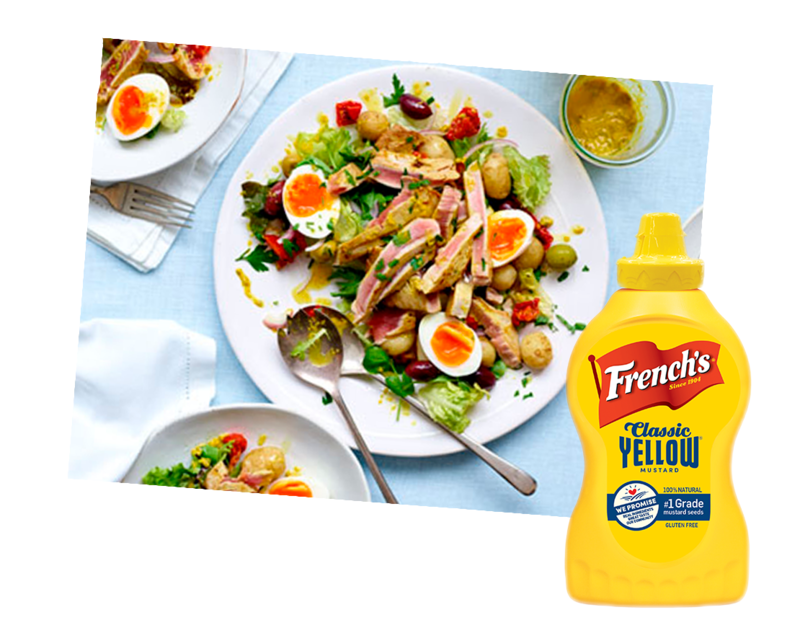 Whisk together the remaining French's Classic Yellow Mustard and oil with the capers. To build the salad, place the potatoes, leaves, olives, red onion and tomatoes in a large serving bowl. Halve the eggs and place on the salad with the tuna. Drizzle over the dressing then sprinkle on the parsley.